But I can't match most of the demons to Norton Juster's text. (Though to be fair, Jules Feiffer was deliberately unparticular about that.) How many can we identify? 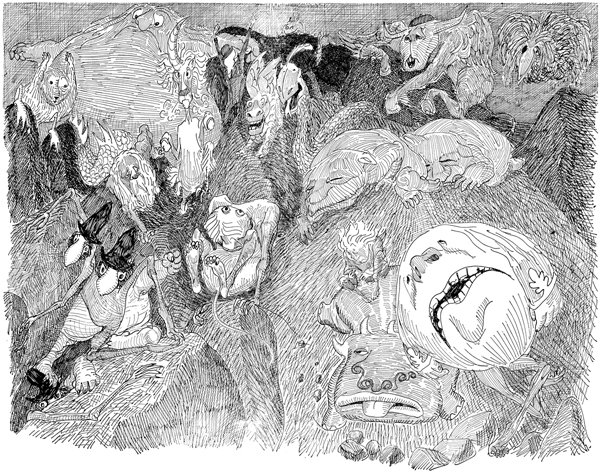 We can identify all but five of the sixteen illustrated demons from the text of The Phantom Tollbooth itself. Edit: I just noticed that there's a bird-headed snake thing near the back for the first time (#16 in the updated graphic... I had always thought it's head was part of #7's body!). 1. The Horrible Hopping Hindsight: "…fellow whose eyes were in the rear and whose rear was in the front." 2. The Triple Demons of Compromise: "one tall and thin, one short and fat, and the third exactly like the other two." That's difficult to represent visually but the trio labeled with a '2' is the only trio, the foremost is spindly, the rearmost is more robust, and the third one climbing up over the edge of the cliff has its body hidden, but has one spindly arm and one thick arm. 3. The Demon of Insincerity: is illustrated first in the chapter "Unwelcoming Committee," and is recognizable as such. 4. The Gelatinous Giant: is illustrated first in the chapter "Unwelcoming Committee," and is recognizable as such. 6. The Dilemma: "…the ugly Dilemma , snorting steam and looking intently for someone to catch on the ends of his long pointed horns, while his hoofs bit eagerly at the ground." This illustration shows only a single visible horn (perhaps the other is hidden behind the first? ), but does show hooves and snorted steam. The Dilemma is also described immediately after the Terrible Trivium and the Gelatinous Giant which appear just behind in the illustration. 8. The Gorgons of Hate and Malice: "…inching along like giant soft-shelled snails, with blazing eyes and wet anxious mouths came the Gorgons of Hate and Malice, leaving a trail of slime behind them and moving much more quickly than you'd think." 9. ? : @OrganicMarble points out that this monster is a candidate for being the Dilemma since it is also horned and hoofed, although it is not snorting steam. 10. The Everpresent Wordsnatcher: is illustrated twice in the earlier chapter "A Very Dirty Bird," and is recognizable as such. 11. The Overbearing Know-it-all: "…his heavy bulbous body lurching dangerously on the spindly legs which barely supported him… a dismal demon who was mostly mouth…"
12. The Gross Exaggeration: "Next to [the Overbearing Know-it-all] and a little behind came the Gross Exaggeration… they hunted together…"
13. The Threadbare Excuse: This monster's descriptive paragraph follows immediately after the Gross Exaggeration's, and reads in part "Riding along on the back of anyone who'd carry him was the Threadbare Excuse, a small pathetic figure whose clothes were worn and tattered…"
15. The Terrible Trivium: is illustrated first in the chapter "A Very Dirty Bird," and is recognizable as such. He is also described as "He was beautifully dressed in a dark suit with a well-pressed shirt and tie.… But his expression was somewhat blank. In fact it was completely blank, for he had neither eyes, nose, nor mouth." Not the answer you're looking for? Browse other questions tagged character-identification the-phantom-tollbooth jules-feiffer or ask your own question. Which famous people can be identified in Death Becomes Her?